The NSW branch of AVATAR was the first chapter to be formalised outside of the Queensland group. The group is multidisciplinary with extensive clinical expertise with vascular device insertion and management. The group has been involved in local, national and international research studies and have published numerous manuscripts related to vascular access. The group is also heavily involved in teaching and credentialing clinicians in ultrasound guided vascular access techniques. The group has met both informally and at formal functions to discuss challenges with vascular access and infusion therapy. The NSW branch has members currently involved in a number of AVATAR coordinated and locally based research. Evan Alexandrou is a Senior Lecturer with the School of Nursing and Midwifery at the Western Sydney University. Evan is also a Clinical Nurse Consultant in Central Venous Access and Parenteral Nutrition at Liverpool Hospital, as well as a Clinical Nurse Specialist in Intensive Care where he divides his time inserting and managing central venous catheters and undertaking clinical care of critically ill patients. Evan is involved in clinical education at an undergraduate and postgraduate level. 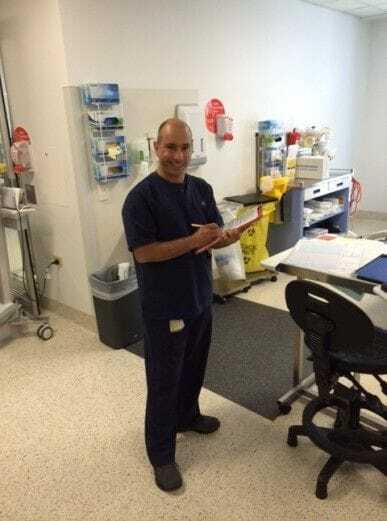 He teaches in the Nursing program at Western Sydney University and is also a Conjoint Lecturer with the Faculty of Medicine at the University of New South Wales where he teaches vascular access to medical trainees. As an Adjunct Senior Research Fellow with the AVATAR group, Evan has been involved in numerous research projects including randomised trials with the group. Notably, he is the chief investigator of the One Million Global Peripheral Intravenous Catheter Study the world's largest study ever undertaken in vascular access with over 42,000 patient devices reviewed in some 50 countries.